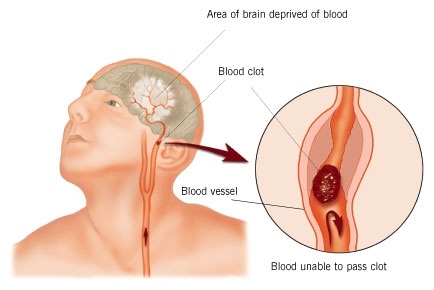 § A cerebrovascular accident (CVA), an ischemic stroke or “brain attack,” is a sudden loss of brain function resulting from Cerebral Vascular Accident (Ischemic Stroke) a disruption of the blood supply to a part of the brain. § Stroke is the primary cerebrovascular disorder in the United States. § Strokes are usually hemorrhagic (15%) or ischemic/nonhemorrhagic (85%). § Ischemic strokes are categorized according to their cause: large artery thrombotic strokes (20%), small penetrating artery thrombotic strokes (25%), cardiogenic embolic strokes (20%), cryptogenic strokes (30%), and other (5%). § Cryptogenic strokes have no known cause, and other strokes result from causes such as illicit drug use, coagulopathies, migraine, and spontaneous dissection of the carotid or vertebral arteries. § The result is an interruption in the blood supply to the brain, causing temporary or permanent loss of movement, thought, memory, speech, or sensation. General signs and symptoms include numbness or weakness of face, arm, or leg (especially on one side of body); confusion or change in mental status; trouble speaking or understanding speech; visual disturbances; loss of balance, dizziness, difﬁculty walking; or sudden severe headache. § Frontal lobe damage: Learning capacity, memory, or other higher cortical intellectual functions may be impaired. Such dysfunction may be reﬂected in a limited attention span, difﬁculties in comprehension, forgetfulness, and lack of motivation. § Depression, other psychological problems: emotional lability, hostility, frustration, resentment, and lack of cooperation. § Help patients alter risk factors for stroke; encourage patient to quit smoking, maintain a healthy weight, follow a healthy diet (including modest alcohol consumption), and exercise daily. § Prepare and support patient through carotid endarterectomy. § Administer anticoagulant agents as prescribed (eg, lowdose aspirin therapy). § Decreased cerebral blood ﬂow: Pulmonary care, maintenance of a patent airway, and administration of supplemental oxygen as needed. § Monitor for UTIs, cardiac dysrhythmias, and complications of immobility. § Mental status (memory, attention span, perception, orientation, affect, speech/language). § Sensation and perception (usually the patient has decreased awareness of pain and temperature). § Motor control (upper and lower extremity movement); swallowing ability, nutritional and hydration status, skin integrity, activity tolerance, and bowel and bladder function. § Continue focusing nursing assessment on impairment of function in patient’s daily activities. § Decreased cerebral blood ﬂow due to increased ICP; inadequate oxygen delivery to the brain; pneumonia. The major goals for the patient (and family) may include improved mobility, avoidance of shoulder pain, achievement of selfcare, relief of sensory and perceptual deprivation, prevention of aspiration, continence of bowel and bladder, improved thought processes, achieving a form of communication, maintaining skin integrity, restored family functioning, improved sexual function, and absence of complications. Goals are affected by knowledge of what the patient was like before the stroke. § Position to prevent contractures; use measures to relieve pressure, assist in maintaining good body alignment, and prevent compressive neuropathies. § Apply a splint at night to prevent ﬂexion of affected extremity. § Prevent adduction of the affected shoulder with a pillow placed in the axilla. § Elevate affected arm to prevent edema and ﬁbrosis. § Position ﬁngers so that they are barely ﬂexed; place hand in slight supination. If upper extremity spasticity is noted, do not use a hand roll; dorsal wrist splint may be used. § Change position every 2 hours; place patient in a prone position for 15 to 30 minutes several times a day. § Provide full range of motion four or ﬁve times a day to maintain joint mobility, regain motor control, prevent contractures in the paralyzed extremity, prevent further deterioration of the neuromuscular system, and enhance circulation. If tightness occurs in any area, perform rangeofmotion exercises more frequently. § Exercise is helpful in preventing venous stasis, which may predispose the patient to thrombosis and pulmonary embolus. § Observe for signs of pulmonary embolus or excessive cardiac workload during exercise period (eg, shortness of breath, chest pain, cyanosis, and increasing pulse rate). § Supervise and support patient during exercises; plan frequent short periods of exercise, not longer periods; encourage patient to exercise unaffected side at intervals throughout the day. § Start an active rehabilitation program when consciousness returns (and all evidence of bleeding is gone, when indicated). § Teach patient to maintain balance in a sitting position, then to balance while standing (use a tilt table if needed). § Begin walking as soon as standing balance is achieved (use parallel bars and have wheelchair available in anticipation of possible dizziness). § Keep training periods for ambulation short and frequent. NURSING ALERT: Initiate a full rehabilitation program even for elderly patients. § Never lift patient by the ﬂaccid shoulder or pull on the affected arm or shoulder. § Use proper patient movement and positioning (eg, ﬂaccid arm on a table or pillows when patient is seated, use of sling when ambulating). § Rangeofmotion exercises are beneﬁcial, but avoid overstrenuous arm movements. § Elevate arm and hand to prevent dependent edema of the hand; administer analgesic agents as indicated. § Encourage personal hygiene activities as soon as the patient can sit up; select suitable selfcare activities that can be carried out with one hand. § Help patient to set realistic goals; add a new task daily. § As a ﬁrst step, encourage patient to carry out all selfcare activities on the unaffected side. § Make sure patient does not neglect affected side; provide assistive devices as indicated. § Improve morale by making sure patient is fully dressed during ambulatory activities. § Assist with dressing activities (eg, clothing with Velcro closures; put garment on the affected side ﬁrst); keep environment uncluttered and organized. § Provide emotional support and encouragement to prevent fatigue and discouragement. § Approach patient with a decreased ﬁeld of vision on the side where visual perception is intact; place all visual stimuli on this side. § Teach patient to turn and look in the direction of the defective visual ﬁeld to compensate for the loss; make eye contact with patient, and draw attention to affected side. § Increase natural or artiﬁcial lighting in the room; provide eyeglasses to improve vision. § Remind patient with hemianopsia of the other side of the body; place extremities so that patient can see them. § Observe patient for paroxysms of coughing, food dribbling out or pooling in one side of the mouth, food retained for long periods in the mouth, or nasal regurgitation when swallowing liquids. § Consult with speech therapist to evaluate gag reﬂexes; assist in teaching alternate swallowing techniques, advise patient to take smaller boluses of food, and inform patient of foods that are easier to swallow; provide thicker liquids or pureed diet as indicated. § Have patient sit upright, preferably on chair, when eating and drinking; advance diet as tolerated. § Prepare for GI feedings through a tube if indicated; elevate the head of bed during feedings, check tube position before feeding, administer feeding slowly, and ensure that cuff of tracheostomy tube is inﬂated (if applicable); monitor and report excessive retained or residual feeding. § Perform intermittent sterile catheterization during period of loss of sphincter control. § Analyze voiding pattern and offer urinal or bedpan on patient’s voiding schedule. § Assist the male patient to an upright posture for voiding. § Provide highﬁber diet and adequate ﬂuid intake (2 to 3 L/day), unless contraindicated. § Establish a regular time (after breakfast) for toileting. § Reinforce structured training program using cognitiveperceptual retraining, visual imagery, reality orientation, and cueing procedures to compensate for losses. § Support patient: Observe performance and progress, give positive feedback, convey an attitude of conﬁdence and hopefulness; provide other interventions as used for improving cognitive function after a head injury. § Reinforce the individually tailored program. § Jointly establish goals, with patient taking an active part. § Make the atmosphere conducive to communication, remaining sensitive to patient’s reactions and needs and responding to them in an appropriate manner; treat patient as an adult. § Provide strong emotional support and understanding to allay anxiety; avoid completing patient’s sentences. § Be consistent in schedule, routines, and repetitions. A written schedule, checklists, and audiotapes may help with memory and concentration; a communication board may be used. § Maintain patient’s attention when talking with patient, speak slowly, and give one instruction at a time; allow patient time to process. § Talk to aphasic patients when providing care activities to provide social contact. § Frequently assess skin for signs of breakdown, with emphasis on bony areas and dependent body parts. § Employ pressurerelieving devices; continue regular turning and positioning (every 2 hours minimally); minimize shear and friction when positioning. § Keep skin clean and dry, gently massage healthy dry skin, and maintain adequate nutrition. § Provide counseling and support to family. § Involve others in patient’s care; teach stress management techniques and maintenance of personal health for family coping. § Give family information about the expected outcome of the stroke, and counsel them to avoid doing things for patient that he or she can do. § Develop attainable goals for patient at home by involving the total health care team, patient, and family. § Encourage everyone to approach patient with a supportive and optimistic attitude, focusing on abilities that remain; explain to family that emotional lability usually improveswith time. § Perform indepth assessment to determine sexual history before and after the stroke. § of medications, counseling regarding coping skills, suggestions for alternative sexual positions, and a means of sexual expression and satisfaction. § Teach patient to resume as much selfcare as possible; provide assistive devices as indicated. § Have occupational therapist make a home assessment and recommendations to help patient become more independent. § Coordinate care provided by numerous health care professionals; help family plan aspects of care. § Advise family that patient may tire easily, become irritable and upset by small events, and show less interest in daily events. § Make referral for home speech therapy. Encourage family involvement. Provide family with practical instructions to help patient between speech therapy sessions. § Discuss patient’s depression with physician for possible antidepressant therapy. § Encourage patient to attend communitybased stroke clubs to give a feeling of belonging and fellowship with others. § Encourage patient to continue with hobbies, recreational and leisure interests, and contact with friends to prevent social isolation. § Encourage family to support patient and give positive reinforcement. § Remind spouse and family to attend to personal health and wellbeing. § Has no complaints of pain. § Achieves selfcare; performs hygiene care; uses adaptive equipment. § Demonstrates techniques to compensate for altered sensory reception, such as turning the head to see people or objects. § Achieves normal bowel and bladder elimination. § Participates in cognitive improvement program. § Maintains intact skin without breakdown. § Family members demonstrate a positive attitude and coping mechanisms. § Develops alternative approaches to sexual expression. § Maintain usual/improved level of consciousness, cognition, and motor/sensory function. § Demonstrate stable vital signs and absence of signs of increased ICP. 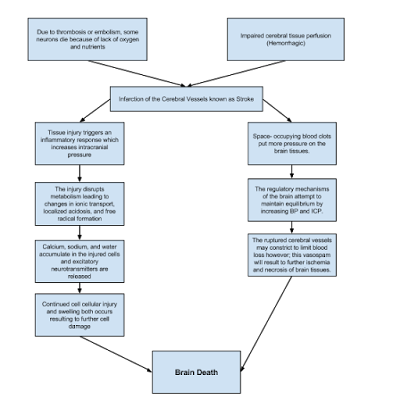 § Assess factors related to individual situation for decreased cerebral perfusion and potential for increased ICP. § Rationale: Assessment will determine and influence the choice of interventions. Deterioration in neurological signs or failure to improve after initial insult may reflect decreased intracranial adaptive capacity requiring patient to be transferred to critical area for monitoring of ICP, other therapies. If the stroke is evolving, patient can deteriorate quickly and require repeated assessment and progressive treatment. If the stroke is “completed,” the neurological deficit is nonprogressive, and treatment is geared toward rehabilitation and preventing recurrence. § Closely assess and monitor neurological status frequently and compare with baseline. § Rationale: Assesses trends in level of consciousness (LOC) and potential for increased ICP and is useful in determining location, extent, and progression of damage. May also reveal presence of TIA, which may warn of impending thrombotic CVA. § changes in blood pressure, compare BP readings in both arms. § Rationale: Fluctuations in pressure may occur because of cerebral injury in vasomotor area of the brain. Hypertension or postural hypotension may have been a precipitating factor. Hypotension may occur because of shock (circulatory collapse). Increased ICPmay occur because of tissue edema or clot formation. Subclavian artery blockage may be revealed by difference in pressure readings between arms. § Heart rate and rhythm, assess for murmurs. § Rationale: Changes in rate, especially bradycardia, can occur because of the brain damage. Dysrhythmias and murmurs may reflect cardiac disease, which may have precipitated CVA (stroke after MI or from valve dysfunction). § Respirations, noting patterns and rhythm (periods of apnea after hyperventilation), Cheyne-Stokes respiration. § Rationale: Irregularities can suggest location of cerebral insult or increasing ICP and need for further intervention, including possible respiratory support. § Evaluate pupils, noting size, shape, equality, light reactivity. § Rationale: Pupil reactions are regulated by the oculomotor (III) cranial nerve and are useful in determining whether the brain stem is intact. Pupil size and equality is determined by balance between parasympathetic and sympathetic innervation. Response to light reflects combined function of the optic (II) and oculomotor (III) cranial nerves. § Document changes in vision: reports of blurred vision, alterations in visual field, depth perception. § Rationale: Specific visual alterations reflect area of brain involved, indicate safety concerns, and influence choice of interventions. § Assess higher functions, including speech, if patient is alert. § Rationale: Changes in cognition and speech content are an indicator of location and degree of cerebral involvement and may indicate deterioration or increased ICP. § Position with head slightly elevated and in neutral position. § Rationale: Reduces arterial pressure by promoting venous drainage and may improve cerebral perfusion. § Maintain bedrest, provide quiet and relaxing environment, restrict visitors and activities. Cluster nursing interventions and provide rest periods between care activities. Limit duration of procedures. § Rationale: Continuous stimulation or activity can increase intracranial pressure (ICP). Absolute rest and quiet may be needed to prevent rebleeding in the case of hemorrhage. § Prevent straining at stool, holding breath. § Rationale: Valsalva maneuver increases ICP and potentiates risk of rebleeding. § Assess for nuchal rigidity, twitching, increased restlessness, irritability, onset of seizure activity. § Rationale: Indicative of meningeal irritation, especially in hemorrhage disorders. Seizures may reflect increased ICP or cerebral injury, requiring further evaluation and intervention. § Administer supplemental oxygen as indicated. § Rationale: Reduces hypoxemia. Hypoxemia can cause cerebral vasodilation and increase pressure or edema formation. § Rationale: Thrombolytic agents are useful in dissolving clot when started within 3 hr of initial symptoms. Thirty percent are likely to recover with little or no disability. Treatment is based on trying to limit the size of the infarct, and use requires close monitoring for signs of intracranial hemorrhage. Note: These agents are contraindicated in cranial hemorrhage as diagnosed by CT scan. § Rationale: May be used to improve cerebral blood flow and prevent further clotting when embolism and/or thrombosis is the problem. § Rationale: Contraindicated in hypertensive patients because of increased risk of hemorrhage. § Rationale: Used with caution in hemorrhagic disorder to prevent lysis of formed clots and subsequent rebleeding. § Rationale: Chronic hypertension requires cautious treatment because aggressive management increases the risk of extension of tissue damage. § Peripheral vasodilators: cyclandelate (Cyclospasmol), papaverine (Pavabid), isoxsuprine (Vasodilan). § Rationale: Transient hypertension often occurs during acute stroke and resolves often without therapeutic intervention.Used to improve collateral circulation or decrease vasospasm. § Rationale: Use is controversial in control of cerebral edema. § Neuroprotective agents: calcium channel blockers, excitatory amino acid inhibitors, gangliosides. 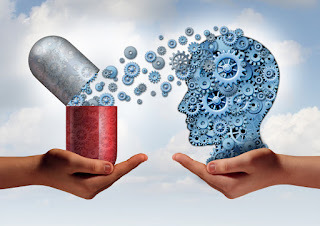 § Rationale: These agents are being researched as a means to protect the brain by interrupting the destructive cascade of biochemical events (influx of calcium into cells, release of excitatory neurotransmitters, buildup of lactic acid) to limit ischemic injury. § Rationale: May be used to control seizures and/or for sedative action. Note: Phenobarbital enhances action of antiepileptics. § Rationale: Prevents straining during bowel movement and corresponding increase of ICP. § Prepare for surgery, as appropriate: endarterectomy, microvascular bypass, cerebral angioplasty. § Rationale: May be necessary to resolve situation, reduce neurological symptoms of recurrent stroke. § Monitor laboratory studies as indicated: prothrombin time (PT) and/or activated partial thromboplastin time (aPTT) time, Dilantin level. § Rationale: Provides information about drug effectiveness and/or therapeutic level. § Maintain/increase strength and function of affected or compensatory body part. § Maintain optimal position of function as evidenced by absence of contractures, foot drop. § Demonstrate techniques/behaviors that enable resumption of activities. § Assess extent of impairment initially and on a regular basis. Classify according to 0–4 scale. § Rationale: Identifies strengths and deficiencies that may provide information regarding recovery. Assists in choice of interventions, because different techniques are used for flaccid and spastic paralysis. § Change positions at least every 2 hr (supine, side lying) and possibly more often if placed on affected side. § Rationale: Reduces risk of tissue injury. Affected side has poorer circulation and reduced sensation and is more predisposed to skin breakdown. § Position in prone position once or twice a day if patient can tolerate. § Rationale: Helps maintain functional hip extension; however, may increase anxiety, especially about ability to breathe. § Prop extremities in functional position; use footboard during the period of flaccid paralysis. Maintain neutral position of head. § Rationale: Prevents contractures and footdrop and facilitates use when function returns. Flaccid paralysis may interfere with ability to support head, whereas spastic paralysis may lead to deviation of head to one side. § Use arm sling when patient is in upright position, as indicated. § Rationale: During flaccid paralysis, use of sling may reduce risk of shoulder subluxation and shoulder-hand syndrome. § Rationale: Flexion contractures occur because flexor muscles are stronger than extensors. § Rationale: Prevents adduction of shoulder and flexion of elbow. § Rationale: Promotes venous return and helps prevent edema formation. § Place hard hand-rolls in the palm with fingers and thumb opposed. § Rationale: Hard cones decrease the stimulation of finger flexion, maintaining finger and thumb in a functional position. § Rationale: Maintains functional position. § Rationale: Prevents external hip rotation. § Discontinue use of footboard, when appropriate. § Rationale: Continued use (after change from flaccid to spastic paralysis) can cause excessive pressure on the ball of the foot, enhance spasticity, and actually increase plantar flexion. § Observe affected side for color, edema, or other signs of compromised circulation. § Rationale: Edematous tissue is more easily traumatized and heals more slowly. § Inspect skin regularly, particularly over bony prominences. Gently massage any reddened areas and provide aids such as sheepskin pads as necessary. § Rationale: Pressure points over bony prominences are most at risk for decreased perfusion. Circulatory stimulation and padding help prevent skin breakdown and decubitus development. § Begin active or passive ROM to all extremities (including splinted) on admission. Encourage exercises such as quadriceps/gluteal exercise, squeezing rubber ball, extension of fingers and legs/feet. § Rationale: Minimizes muscle atrophy, promotes circulation, helps prevent contractures. Reduces risk of hypercalciuria and osteoporosis if underlying problem is hemorrhage. Note: Excessive stimulation can predispose to rebleeding. § Assist patient with exercise and perform ROM exercises for both the affected and unaffected sides. Teach and encourage patient to use his unaffected side to exercise his affected side. § Assist patient to develop sitting balance by raising head of bed, assist to sit on edge of bed, having patient to use the strong arm to support body weight and move using the strong leg. Assist to develop standing balance by putting flat walking shoes, support patient’s lower back with hands while positioning own knees outside patient’s knees, assist in using parallel bars. § Rationale:Aids in retraining neuronal pathways, enhancing proprioception and motor response. § Get patient up in chair as soon as vital signs are stable, except following cerebral hemorrhage. § Rationale:Helps stabilize BP (by restoring vasomotor tone), promotes maintenance of extremities in a functional position and emptying of bladder, reducing risk of urinary stones and infections from stasis. Note: If stroke is not completed, activity increases risk of additional bleed. § Pad chair seat with foam or water-filled cushion, and assist patient to shift weight at frequent intervals. § Rationale: To prevent pressure on the coccyx and skin breakdown. § Set goals with patient and SO for participation in activities and position changes. § Rationale: Promotes sense of expectation of improvement, and provides some sense of control and independence. § Encourage patient to assist with movement and exercises using unaffected extremity to support and move weaker side. § Rationale: May respond as if affected side is no longer part of body and needs encouragement and active training to “reincorporate” it as a part of own body. § Provide egg-crate mattress, water bed, flotation device, or specialized beds, as indicated. § Rationale: Promotes even weight distribution, decreasing pressure on bony points and helping to prevent skin breakdown and decubitus formation. Specialized beds help with positioning, enhance circulation, and reduce venous stasis to decrease risk of tissue injury and complications such as orthostatic pneumonia. § Position the patient and align his extremities correctly. Use high-top sneakers to prevent footdrop and contracture and convoluted foam, flotation, or pulsating mattresses or sheepskin. § Rationale: These are measures to prevent pressure ulcers. § Indicate an understanding of the communication problems. § Establish method of communication in which needs can be expressed. § Assess extent of dysfunction: patient cannot understand words or has trouble speaking or making self understood. Differentiate aphasia from dysarthria. § Rationale: Helps determine area and degree of brain involvement and difficulty patient has with any or all steps of the communication process. Patient may have receptive aphasia or damage to the Wernicke’s speech area which is characterized by difficulty of understanding spoken words. He may also have expressive aphasia or damage to the Broca’s speech areas, which is difficulty in speaking words correctly, or may experience both. Choice of interventions depends on type of impairment. Aphasia is a defect in using and interpreting symbols of language and may involve sensory and/or motor components (inability to comprehend written and/or spoken words or to write, make signs, speak). A dysarthric person can understand, read, and write language but has difficulty forming and pronouncing words because of weakness and paralysis of oral musculature. Patient may lose ability to monitor verbal output and be unaware that communication is not sensible. § Listen for errors in conversation and provide feedback. § Rationale: Feedback helps patient realize why caregivers are not understanding or responding appropriately and provides opportunity to clarify meaning. § Rationale: Tests for receptive aphasia. § Point to objects and ask patient to name them. § Rationale: Tests for expressive aphasia. Patient may recognize item but not be able to name it. § Have patient produce simple sounds (“Dog,” “meow,” “Shh”). § Rationale: Identifies dysarthria, because motor components of speech (tongue, lip movement, breath control) can affect articulation and may or may not be accompanied by expressive aphasia. § Ask patient to write his name and a short sentence. If unable to write, have patient read a short sentence. § Rationale: Tests for writing disability (agraphia) and deficits in reading comprehension (alexia), which are also part of receptive and expressive aphasia. § Write a notice at the nurses’ station and patient’s room about speech impairment. Provide a special call bell that can be activated by minimal pressure if necessary. § Rationale: Allays anxiety related to inability to communicate and fear that needs will not be met promptly. § Provide alternative methods of communication: writing, pictures. § Rationale: Provides communication needs of patient based on individual situation and underlying deficit. § Anticipate and provide for patient’s needs. § Rationale: Helpful in decreasing frustration when dependent on others and unable to communication desires. § Talk directly to patient, speaking slowly and distinctly. Phrase questions to be answered simply by yes or no. Progress in complexity as patient responds. § Rationale: Reduces confusion and allays anxiety at having to process and respond to large amount of information at one time. As retraining progresses, advancing complexity of communication stimulates memory and further enhances word and idea association. § Speak in normal tones and avoid talking too fast. Give patient ample time to respond. Avoid pressing for a response. § Rationale: Patient is not necessarily hearing impaired, and raising voice may irritate or anger patient. Forcing responses can result in frustration and may cause patient to resort to “automatic” speech (garbled speech, obscenities). § Encourage SO/visitors to persist in efforts to communicate with patient: reading mail, discussing family happenings even if patient is unable to respond appropriately. § Rationale: It is important for family members to continue talking to patient to reduce patient’s isolation, promote establishment of effective communication, and maintain sense of connectedness with family. § Discuss familiar topics, e.g., weather, family, hobbies, jobs. § Rationale: Promotes meaningful conversation and provides opportunity to practice skills. § Respect patient’s preinjury capabilities; avoid “speaking down” to patient or making patronizing remarks. § Rationale: Enables patient to feel esteemed, because intellectual abilities often remain intact. § Consult and refer patient to speech therapist. § Rationale: Assesses individual verbal capabilities and sensory, motor, and cognitive functioning to identify deficits/therapy needs. § Regain/maintain usual level of consciousness and perceptual functioning. § Acknowledge changes in ability and presence of residual involvement. § Demonstrate behaviors to compensate for/overcome deficits. § Review pathology of individual condition. § Rationale: Awareness on the type and areas of involvement aid in assessing specific deficit and planning of care. § Observe behavioral responses: crying, inappropriate affect, agitation, hostility, agitation, hallucination. § Rationale: Individual responses are variable, but commonalities such as emotional lability, lowered frustration threshold, apathy, and impulsiveness may complicate care. § Establish and maintain communication with the patient. Set up a simple method of communicating basic needs. Remember to phrase your questions so he’ll be able to answer using this system. Repeat yourself quietly and calmly and use gestures when necessary to help in understanding. § Rationale: Note: even an unresponsive patient may be able to hear, so don’t say anything in his presence you wouldn’t want him to hear and remember. § Eliminate extraneous noise and stimuli as necessary. § Rationale: Reduces anxiety and exaggerated emotional responses and confusion associated with sensory overload. § Speak in calm, comforting, quiet voice, using short sentences. Maintain eye contact. § Rationale: Patient may have limited attention span or problems with comprehension. These measures can help patient attend to communication. § Ascertain patient’s perceptions. Reorient patient frequently to environment, staff, procedures. § Rationale: Assists patient to identify inconsistencies in reception and integration of stimuli and may reduce perceptual distortion of reality. § Evaluate for visual deficits. Note loss of visual field, changes in depth perception (horizontal and/or vertical planes), presence of diplopia (double vision). § Rationale: Presence of visual disorders can negatively affect patient’s ability to perceive environment and relearn motor skills and increases risk of accident and injury. § Approach patient from visually intact side. Leave light on; position objects to take advantage of intact visual fields. Patch affected eye if indicated. § Rationale: Helps the patient to recognize the presence of persons or objects and may help with depth perception problems. This also prevents patient from being startled. Patching the eye may decrease sensory confusion of double vision. § Assess sensory awareness: dull from sharp, hot from cold, position of body parts, joint sense. § Rationale: Diminished sensory awareness and impairment of kinesthetic sense negatively affects balance and positioning and appropriateness of movement, which interferes with ambulation, increasing risk of trauma. § Stimulate sense of touch. Give patient objects to touch, and hold. Have patient practice touching walls boundaries. § Rationale: Aids in retraining sensory pathways to integrate reception and interpretation of stimuli. Helps patient orient self spatially and strengthens use of affected side. § Protect from temperature extremes; assess environment for hazards. Recommend testing warm water with unaffected hand. § Rationale: Promotes patient safety, reducing risk of injury. § Note inattention to body parts, segments of environment, lack of recognition of familiar objects/persons. § Rationale: Agnosia, the loss of comprehension of auditory, visual, or other sensations, may lead result to unilateral neglect, inability to recognize environmental cues, considerable self-care deficits, and disorientation or bizarre behavior. § Encourage patient to watch feet when appropriate and consciously position body parts. Make patient aware of all neglected body parts: sensory stimulation to affected side, exercises that bring affected side across midline, reminding person to dress/care for affected (“blind”) side. § Rationale: Use of visual and tactile stimuli assists in reintegration of affected side and allows patient to experience forgotten sensations of normal movement patterns. § Verbalize acceptance of self in situation. § Talk/communicate with SO about situation and changes that have occurred. § Verbalize awareness of own coping abilities. § Meet psychological needs as evidenced by appropriate expression of feelings, identification of options, and use of resources. § Assess extent of altered perception and related degree of disability. Determine Functional Independence Measure score. § Rationale: Determination of individual factors aids in developing plan of care/choice of interventions and discharge expectations. § Identify meaning of the dysfunction and change to patient. Note ability to understand events, provide realistic appraisal of the situation. § Rationale: Independence is highly valued in American culture but is not as significant in some cultures. Some patients accept and manage altered function effectively with little adjustment, whereas others may have considerable difficulty recognizing and adjust to deficits. In order to provide meaningful support and appropriate problem-solving, healthcare providers need to understand the meaning of the stroke/limitations to patient. § Determine outside stressors: family, work, future healthcare needs. § Rationale: Helps identify specific needs, provides opportunity to offer information and begin problem-solving. Consideration of social factors, in addition to functional status, is important in determining appropriate discharge destination. § Provide psychological support and set realistic short-term goals. Involve the patient’s SO in plan of care when possible and explain his deficits and strengths. § Rationale: To increase the patient’s sense of confidence and can help in compliance to therapeutic regimen. § Encourage patient to express feelings, including hostility or anger, denial, depression, sense of disconnectedness. § Rationale: Demonstrates acceptance of patient in recognizing and beginning to deal with these feelings. § Rationale: Suggests rejection of body part and negative feelings about body image and abilities, indicating need for intervention and emotional support. § Acknowledge statement of feelings about betrayal of body; remain matter-of-fact about reality that patient can still use unaffected side and learn to control affected side. Use words (weak, affected, right-left) that incorporate that side as part of the whole body. § Rationale: Helps patient see that the nurse accepts both sides as part of the whole individual. Allows patient to feel hopeful and begin to accept current situation. § Identify previous methods of dealing with life problems. Determine presence of support systems. § Rationale: Provides opportunity to use behaviors previously effective, build on past successes, and mobilize resources. § Emphasize small gains either in recovery of function or independence. § Rationale: Consolidates gains, helps reduce feelings of anger and helplessness, and conveys sense of progress. § Support behaviors and efforts such as increased interest/participation in rehabilitation activities. § Rationale: Suggest possible adaptation to changes and understanding about own role in future lifestyle. § Monitor for sleep disturbance, increased difficulty concentrating, statements of inability to cope, lethargy, withdrawal. § Rationale: May indicate onset of depression (common after effect of stroke), which may require further evaluation and intervention. § Refer for neuropsychological evaluation and/or counseling if indicated. § Rationale: May facilitate adaptation to role changes that are necessary for a sense of feeling/being a productive person. Note: Depression is common in stroke survivors and may be a direct result of the brain damage and/or an emotional reaction to sudden-onset disability. § Demonstrate techniques/lifestyle changes to meet self-care needs. § Perform self-care activities within level of own ability. § Identify personal/community resources that can provide assistance as needed. § Assess abilities and level of deficit (0–4 scale) for performing ADLs. § Rationale: Aids in planning for meeting individual needs. § Avoid doing things for patient that patient can do for self, but provide assistance as necessary. § Rationale: To maintain self-esteem and promote recovery, it is important for the patient to do as much as possible for self. These patients may become fearful and independent, although assistance is helpful in preventing frustration. § Be aware of impulsive actions suggestive of impaired judgment. § Rationale: May indicate need for additional interventions and supervision to promote patient safety. § Maintain a supportive, firm attitude. Allow patient sufficient time to accomplish tasks. Don’t rush the patient. § Rationale: Patients need empathy and to know caregivers will be consistent in their assistance. § Provide positive feedback for efforts and accomplishments. § Rationale: Enhances sense of self-worth, promotes independence, and encourages patient to continue endeavors. § Create plan for visual deficits that are present: Place food and utensils on the tray related to patient’s unaffected side; Situate the bed so that patient’s unaffected side is facing the room with the affected side to the wall; Position furniture against wall/out of travel path. § Rationale: Patient will be able to see to eat the food. Will be able to see when getting in/out of bed and observe anyone who comes into the room. Provides for safety when patient is able to move around the room, reducing risk of tripping/falling over furniture. § Provide self-help devices: extensions with hooks for picking things up from the floor, toilet risers, long-handled brushes, drinking straw, leg bag for catheter, shower chair. Encourage good grooming and makeup habits. § Rationale: To enable the patient to manage for self, enhancing independence and self-esteem, reduce reliance on others for meeting own needs, and enables the patient to be more socially active. § Encourage SO to allow patient to do as much as possible for self. § Rationale: Reestablishes sense of independence and fosters self-worth and enhances rehabilitation process. Note: This may be very difficult and frustrating for the caregiver, depending on degree of disability and time required for patient to complete activity. § Assess patient’s ability to communicate the need to void and/or ability to use urinal, bedpan. Take patient to the bathroom at periodic intervals for voiding if appropriate. § Rationale: Patient may have neurogenic bladder, be inattentive, or be unable to communicate needs in acute recovery phase, but usually is able to regain independent control of this function as recovery progresses. § Identify previous bowel habits and reestablish normal regimen. Increase bulk in diet, encourage fluid intake, increased activity. § Rationale: Assists in development of retraining program (independence) and aids in preventing constipation and impaction (long-term effects). § Teach the patient to comb hair, dress, and wash.
§ Rationale: To promote sense o f independence and self-esteem. § Refer patient to physical and occupational therapist. § Rationale: Rehabilitation helps to relearn skills that are lost when part of the brain is damaged. It also teaches new ways of performing tasks to circumvent or compensate for any residual disabilities.